THE BANKING INQUIRY has been widely viewed as a pretty mundane affair so far with experts telling the Oireachtas committee much of what we already know about the crisis. While the hearings have been informative and somewhat illuminating, particularly when Central Bank governor Patrick Honohan was before the committee last month, many members have privately admitted it hasn’t been very exciting. However, the inquiry will today hear from Professor William ‘Bill’ Black of the University of Missouri-Kansas City. Black is widely-respected expert in banking fraud who recently helped the World Bank develop a series of anti-corruption initiatives. He will be talking about banking policy, systems and practices before TDs and Senators and his central thesis is that the leading cause of catastrophic bank failures has long been senior insider fraud. Inquiry sources said that they expected his evidence to be “colourful”. Legal advisors expressed concern at a private session yesterday that Black could stray beyond the inquiry’s legal remit in his evidence today. Black has argued that the large salaries paid to some senior bankers results in the encouragement of fraud and has written extensively on the “perverse effects of compensation” in the banking sector. Black has previously been harshly critical of Finnish banking expert Peter Nyberg’s report into the Irish crisis, arguing that his report had ignored alleged accounting control fraud in the Irish banking sector. Nyberg, who appeared before the committee last December, said in his 2011 report that the willingness of banks to issue high-value loans for risky commercial property was a fundamental cause of the banking crash. He said the bank guarantee was issued on the belief that the Irish banks were solvent, when in fact they were not. 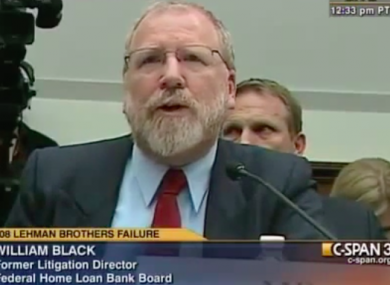 #bankinginquiry hears from @WilliamKBlack tmw. He’s previously described Nyberg report into Irish banking crisis as "pathetically weak"
During a private meeting of the banking inquiry yesterday concerns were raised by legal advisers as to what can be expected from Black’s evidence to the committee. It’s understood he submitted a lengthy, 75-page document to the inquiry for its consideration, but his official evidence will be confined to his opening statement. Also appearing before the inquiry today will be Mario Nava from the European Commission who will given evidence on banking regulation and supervision with the EU’s regulation in the run-up to the financial crisis likely to be discussed. Separately, the inquiry said yesterday evening that the Central Bank governor Patrick Honohan would be assisting it in seeking cooperation from the European Central Bank. Email “After weeks of boredom, the banking inquiry could get very interesting today...”. Feedback on “After weeks of boredom, the banking inquiry could get very interesting today...”.